Dr. Cooper utilizes a gentle hands-on approach to keep your spine in alignment so you can move freely as you garden, work out, dance, hike, or spin your way into awesome shape. Dr. Cooper teaches you how to permanently lose weight without fad diets or deprivation so you can actually enjoy shopping for that new bathing suit, turn heads at your next reunion, and fit into your skinny jeans once and for all. Dr. Cooper's EFT sessions will lead to personal breakthroughs for you. Say goodbye to feeling stuck, anxious and unworthy and say hello instead to a motivated, focused and empowered new you! 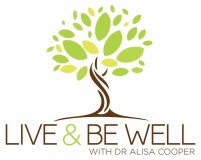 Dr. Alisa Cooper offers exceptional chiropractic, nutrition and EFT services in combination or individually. 10 Tips to get the most out of your detox! with Dr. Cooper to discuss your needs.